1Preheat oven to 130°C (250 ˚F / Gas mark ½). 2Line an oven tray with foil. Brush with melted butter and dust with cornflour, shaking off excess. 3Mark a 24cm-diameter circle on foil. 4Use an electric mixer to whisk egg whites in a clean dry bowl until soft peaks form. Gradually add sugar, 1 tablespoon at a time, beating well after each addition, until meringue is thick and glossy and sugar dissolved. 5Rub a little meringue between fingers. If still “gritty” with sugar, continue to whisk until sugar dissolves. 6Add cornflour, vinegar and vanilla and whisk until just combined. 7Spoon meringue onto the foil, using the marked circle as a guide. Smooth sides and top of pavlova. Use a small spatula to form little peaks around edge of pavlova. 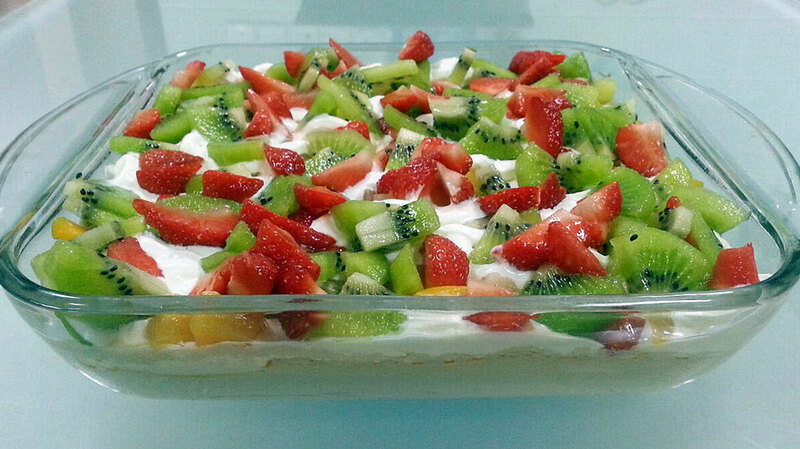 8Bake in oven for 1½ hours or until pavlova is dry to the touch. Turn off oven. 9Leave pavlova in oven with the door ajar to cool completely. 10When completely cold, transfer to serving plate or store in an airtight container until required. 11Use an electric mixer to whisk the cream and icing sugar in a medium bowl until firm peaks form. 12Spoon cream onto the top of pavlova. Pour lime juice into a ceramic or glass bowl, add banana slices and toss to coat with juice. Drain. 13Decorate pavlova with banana, kiwifruit, passionfruit and lime rind.